No matter what medium you experience Les Misérables in, it is always exhaustive. Tom Hooper’s momentum from the award winning The King’s Speech has presented us with a worthy film adaptation of the musical based on the original novel. Featuring rarely utilized live singing and highly aware cinematography, this adaptation is an event for fans. For casual spectators, the film is strenuous with its relentless singing and seamless scene transitions. In 1815, after almost twenty years as a prisoner performing hard labor, Jean Valjean (Hugh Jackman) has been released on lifetime parole by Inspector Javert (Russell Crowe). He immediately steals a sack full of silver from a Priest, caught instantly, and given a reprieve from the priest along with two candlesticks. Some years later, Jean has broken parole and become a wealthy garment factory owner, and has shed his delinquent identity. A fight between factory workers and Fantine (Anne Hathaway) provokes her dismissal from the factory, then resorts to selling her hair and partaking in prostitution in order to support her illegitimate daughter, Cosette (Amanda Seyfried & Isabelle Allen). Jean promises to Fantine to find her daughter and take care of her, but he is also on the lam from Javert, who in-turn has made it his life’s duty to capture and arrest Jean. The motif of forgiveness is as prevalent as the recurring musical themes. Jean’s transformative moment with forgiveness begins with the Priest shooing away the police and giving Jean the candlesticks. It is insinuated that Jean used the stolen silver to lift him into the bourgeoisie, but during all these years he kept the candlesticks (even though this is revealed briefly later). The significance of the candlesticks represents the enlightenment Jean received during a small act of kindness, and these candlesticks deliver that kindness and forgiveness to others who were in the same vulnerable position Jean was once in. This forgiveness is a part of the story’s interconnectedness of a half-dozen characters against the cultural backdrop of the post-Revolution period and the anti-monarchism. 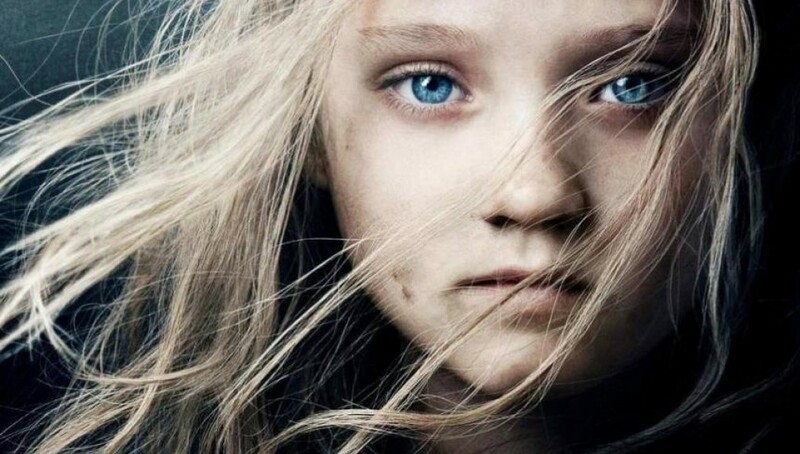 Jean’s adoption of Cosette and his attempt to hide his identity is a continuation of the loyalty and promise he made to Fantine, and the shame of revealing his humble past. Jean is under constant threat of being caught by Javert, and their cat and mouse chase from city to city and through many decades against the political backdrop represents the rat race that both Jean and Javert are both subjected to. 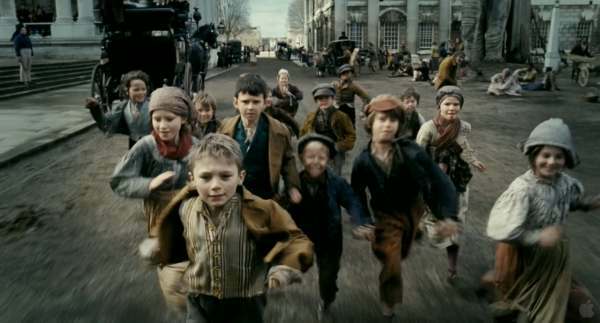 Rising above the working-class, or even worse, peasantry, is another theme in the film. Jean is thankful for receiving the means to rise above his life of delinquency, and as we also learn, Javert was also successful at turning his life around after an early life in prison. Despite Javert’s success, he tends to work diligently to keep others from obtaining success,is representative of the overwhelming oppression in the film. Although the attempt to rise above pre-destination, I am skeptical of the proposed heroism of Marius, who has the ability to move between the estates as his current status sees fit. Although he joins the revolutionaries and is critical of the French Bourgeoisie, he returns to his grandfather’s wealth when all is failed. The sympathetic nature of the Les Misérables musical is incredibly prominent. Although the constant singing of couplets becomes too much to bear, the music’s most prevalent recurring motifs are gorgeous, grand, and fitting. Schönberg’s original score is explosive and powerful, but will entertain the fans already familiar with the musical’s legacy. One of the most impressive features of this film adaptation is that the singing was performed live during filming, which is quite the hassle for production. Although far from an innovation, the live aspect helps the actors emote. How helpful it is in the eye of the beholder; the excessive couplets and campy grandiose nature of the songs can be much to bear after two and a half hours. Les Misérables is thankfully devoid of the third dimension. However, there is already a multi-dimensional depth to the cinematography. Wide-angle photography captures the expansive, grungy scenes in hard focus. The wide-angle shots are perfect for the long-takes of characters singing their solos with all their guts. Their lips quiver, eyes glaze, and front row viewers get a peek at some tonsils. The hard focus helps blur the amount of CGI which keeps the artifice separate from these ambitious but desperate characters. These extreme close-ups are often times captured without balance; characters are rarely in the middle of the shot, often to the extreme sides. Hathaway’s definitive solo “I Dreamed a Dream” is the personification of this imbalance as she sits atop a wall broken and hopeless, representing the capricious nature of justice in post-Revolution France. 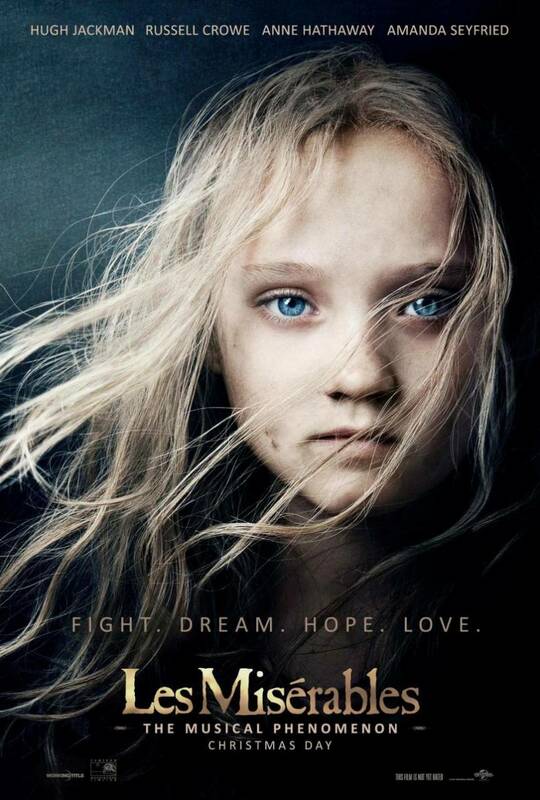 Les Misérables is indeed an event that is best experienced in theaters. Home viewings will prove to be insufficient in depicting the visual depth the cinematography provides, although the potential for sing-a-longs will be a home theater event. Then again, this film’s biggest supporters will be those who were already fans of the franchise, and others may find the film to be overtly grandiose, teetering on camp. Les Misérables is exhausting, that is why stage performances have intermissions, to give the audience a break. While Hooper’s choice of mise-en-scene is appropriate; the film’s overt sentimentalism rivals the sympathy that his award darling The King’s Speech begs for. Either way, the film does make good on its promise to be grand and deep, both visually and thematically.